For those who are wondering what Summits On the Air, or SOTA, works here's a quick summary. SOTA got is start in the United Kingdom, and has been popular in Europe for years. It has gained popularity in the US the last few years. The object is to make two-way communication with another amateur station that is being operated portable on a summit. People activating from a summit are activators, those working them from home or other summits are chasers. Summits are designated by location. Summits in Arkansas are W5A (US fifth call area and Arkansas) and a alphanumeric designation. When I refer to summits I'm activating, I will give both the common name and the SOTA designation. Every summit is assigned a point value given that is awarded to chasers who work the station and to the activator. An activator has to make four contacts to count it as a an activation. Lots of information is available at SOTA's web site, which is comprehensive and very well organized. Over the past year and a half Summits On the Air, or SOTA, has become one of my primary interests in ham radio. 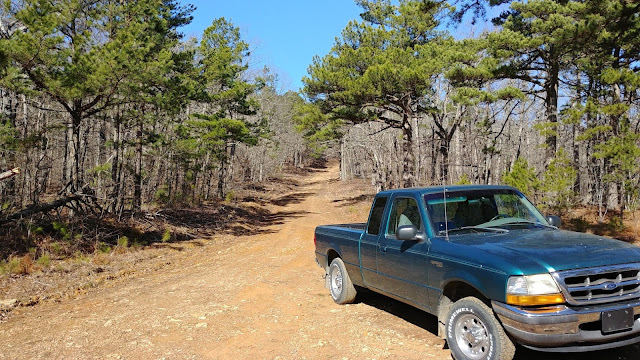 In fact, it was July 5, 2017 I made the drive to Mount Magazine (Arkansas' highest peak) and did the short hike to the summit. 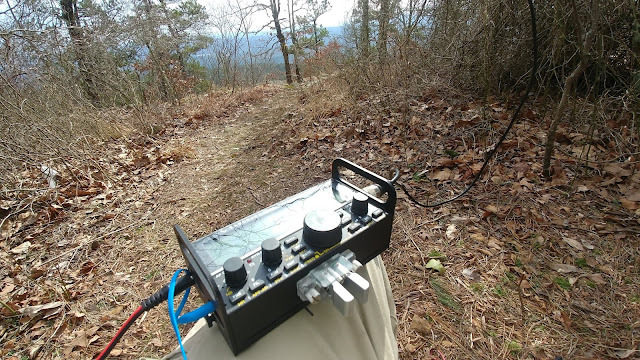 I pulled out my KX-2 QRP transceiver, hooked it up to a small vertical, and proceeded to make contacts across the country on 20 meters. I was hooked. Since then I've done about 30 summits. Most have been in Arkansas, but a few in South Dakota. I'll post some details and pictures from some of my favorite summits and hopefully, start recording the new ones as I get them on this blog. Mount Magazine (W5A/MA-001) was my first summit. 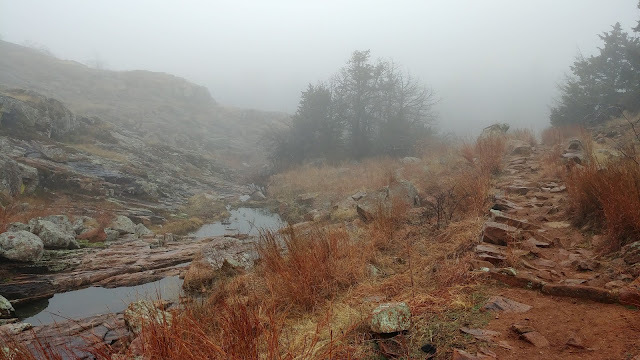 It's easy to get to on a well-marked trail from Mt. Magazine State Park. At the top, you are in a cleared, paved area with zero view, so it's a little anti-climactic for most folks.